Originally excavated to serve as burial vaults for the noble Redoran family, the works beneath Tal'Deic Fortress were abandoned after Grandmaster Llerlu inspected them and found the space "small, constricted, and insufficently imposing for the honored dead of House Redoran." Tal'Deic Fortress is an Ebonheart Pact military outpost in eastern Deshaan, just northwest of the town of Silent Mire. The fortress is run by General Gavryn Redoran, who has been acting strange recently. Several of the local troops have become unruly, and Commander Taldyn will ask you for assistance in dealing with them. Tal'Deic Fortress Objective: Discover the secret of Tal'Deic Fortress. Rules and Regulations: Investigate the Redoran leadership at Tal'Deic Fortress. 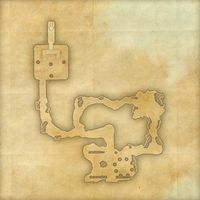 What Lies Beneath: Investigate the ruined crypts near Tal'Deic Fortress. Bad Soldiers: Reduce the "enthusiasm" of the Tal'Deic Fortress' Sentinel enforcers. The Soldier's Alibi: Help a deserting soldier escape his captors. A Service for the Dead: Return a dead man's medallion. Better Than No Drinks — A brewer stall run by Daleez and In-No-Hurry. Fighters Guild — A local branch of the Fighters Guild located in the southeastern part of the Tal'Deic Fortress. Mages Guild — A local branch of the Mages Guild located in the northeastern part of the Tal'Deic Fortress. Nelvani's Supply Tent — A general goods stall run by Binayne Nelvani. Sadis' Logistical Foodstuffs — A mobile kitchen run by the chef Sadis. Tal'Deic Grounds Wayshrine is located to the east of the fortress, near the bridge connecting the outpost with the mainland. 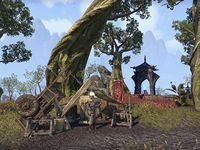 The Arobar's Arch guild kiosk, run by Telvon Arobar, can be found on the road from the fortress to the wayshrine. 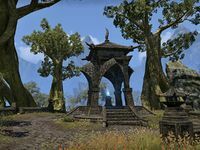 A rowboat next to the wayshrine will take you to Volunidai's Manor during the quest The One That Got Away. During Bad Soldiers, Fervyn mentions a character named Nund who "refused to pay" the Sentinels' money, and now has three broken fingers. However, he does not appear in the game.